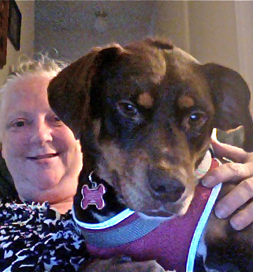 Dixie, a Beagle/Doberman Pinscher mix, was on the short list for euthanasia at an underfunded, overcrowded shelter when Lucky Dog Animal Rescue of Washington, DC, whisked her away to a foster home, thus saving her. Meanwhile, Lorie Foster was having her own crisis. Her 7-year-old assistance dog had passed away from cancer, and the partially disabled woman was finding it difficult to manage without the dog’s help. Lorie and Dixie make a good team, no matter who’s doing the assisting. After several months passed, and her grief over losing her dog had abated somewhat, she decided to look on Petfinder for another dog. That’s when she saw Dixie. Dixie wasn’t trained to be an assistant, but Lorie felt sure she could teach her to do the tasks with which she needed help, and Dixie’s story touched the woman’s heart. She contacted the rescue and arranged to adopt her. “It turns out that it is going to be more difficult to train her to do specific jobs because she has some fears that I first must help her with, ” Lorie says. “However, because of the way I am helping her to trust me and not be so scared of new things and sounds, I have found that I am feeling better myself and finding ways to do things that I depended on my last dog to do for me. So in a twist of fate, the assisted has become the assistant because of her loving kindness and for the love of a dog.